Properties in Palazzo Comunale average 4.7 out of 5 stars. Property 20: Charming And Well Decorated Apartment In The Centre Of The Town, Amazing View ! Property 23: Very cute apartment in the core of Montepulciano and at the feet of the main sq. Property 29: Two bedrooms shining and fresh 140 apartment with free public parking. Property 33: Villa PoliFlora is a modern apartment in Monticchiello of Pienza in Tuscany. Elias was a great host, he met us at apartment, explained everything, and gave us great tips and recommendations. He let us know he was always available by telephone, and checked in by text message to make sure we were having a wonderful time. 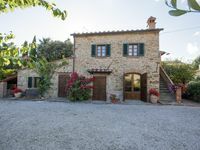 The location is great with ample parking and a short walk to the historic town of Montepulciano. Directly across the street was a cafe with pizza, sandwiches, bakery, coffee, etc that we frequently visited. The food store Conads, which has everything, is just a block up the street. Could not think of a better location for exploring Montepulciano, the local wineries, and nearby hill towns. Great place to stay.